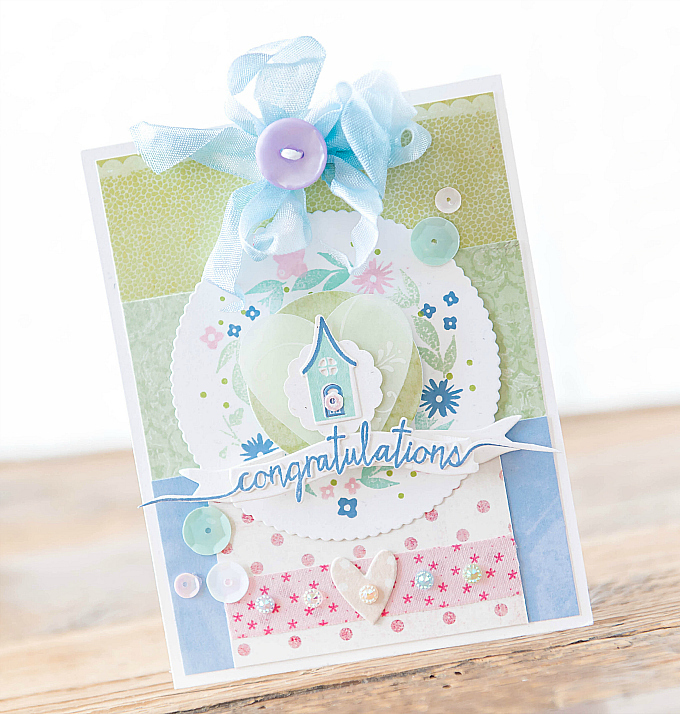 Today's card is a combination of soft colors, touches of home, and wispy layers. I can't quite put into words how much I love teeny, tiny houses. Especially ones made of soft, colorful hues. I think they add such a home-y touch and evoke feelings of comfort and homemade goodness. Something I can't get enough of. To the top, I added a soft ribbon finished with a stitched button. For the centerpiece of this card, I used PTI's Scene It: Basic Backer die for the scalloped circle. To decorate the scalloped circle, I used some of my favorite Wplus9 stamps, Fresh Cut Florals (no longer available, but you can find a similar style here). I used colors of Blueberry Sky, Lovely Lady, Aqua Mist, and Green Parakeet for my ink colors. Atop the wreath, I added a punched circle, along with a vellum heart, cut using Heart Prints from Papertrey Ink. 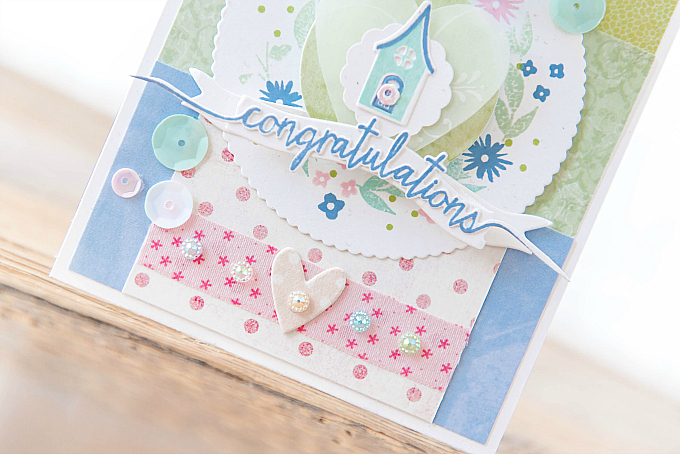 For the wee house, I used PTI's Petite Places: Home and Garden stamp set and dies. 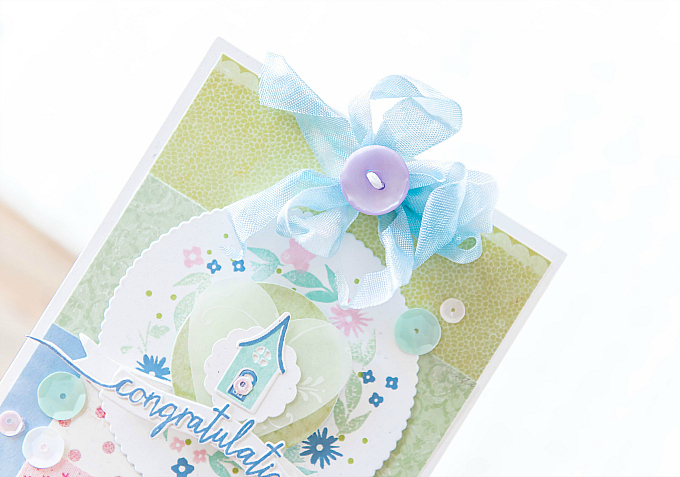 I added a paper banner from the In Stitches die collection, and a sentiment from the Swoosh stamp and die set. At the bottom, I added some polka dot paper, fabric tape, and a dash of sequins and my favorite new rhinestones -which I can't get enough of lately! They are sparkly, shimmery, tiny and come in a delicious array of colors. You may have seen them on a few previous projects, and it's a sure bet that you'll be seeing them again. Their sweet little sparkle just makes me so happy :) Hope you're able to find some wherever you pick up your supplies, but if not, I've found some here and a few more colors below. Thanks for joining me today and have a sparkly kind of day! Another STUNNING creation!! I love the addition of the little house over the vellum. You always layer these stamps so creatively!! This is ever so sweet and delicate Ivana! That is a pretty little birdhouse! Oh my gosh!!! This is sooo precious! 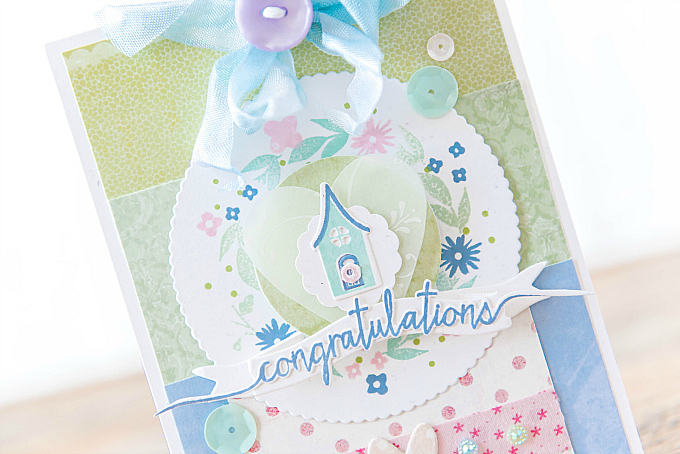 I love that little house as a focal point and the color combinations of this fun make!